I’ve eaten a lot of black bean soup and loved almost every single one. I’m really not all that picky–I’ve had some with a smoky quality from bacon or ham hocks, I’ve had some that are totally smooth, and some that aren’t. 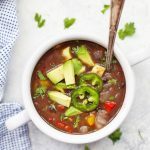 But when the craving struck this week, I knew exactly what I wanted: an easy vegan black bean soup with plenty of veggies and a little bit of kick. 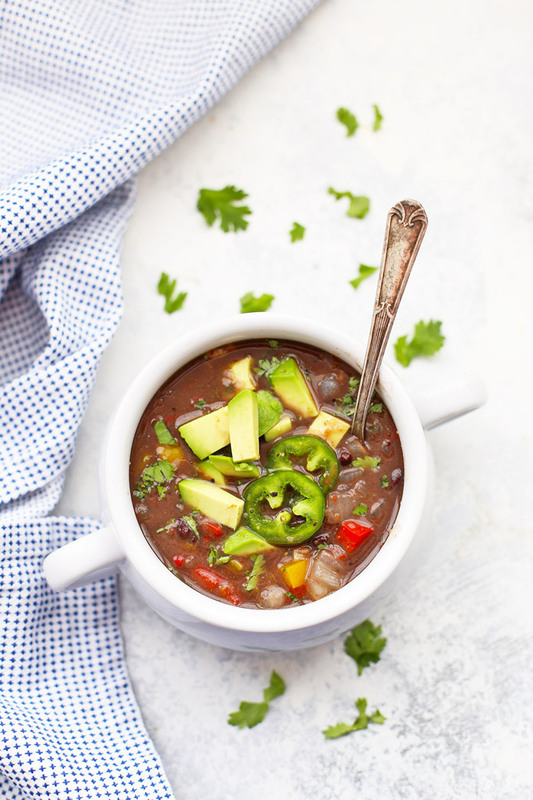 This black bean soup knocked it out of the park! I’m definitely someone who eats with my eyes first, so whenever I’m making a meal, I always try to get a balance of colors. Lots of contrast, complementary colors, or even just a spot of green to brighten things up tends to make a big difference. That was my starting place for this soup. I knew I wanted plenty of black beans, but didn’t want the soup to just look like one big bowl of brown. 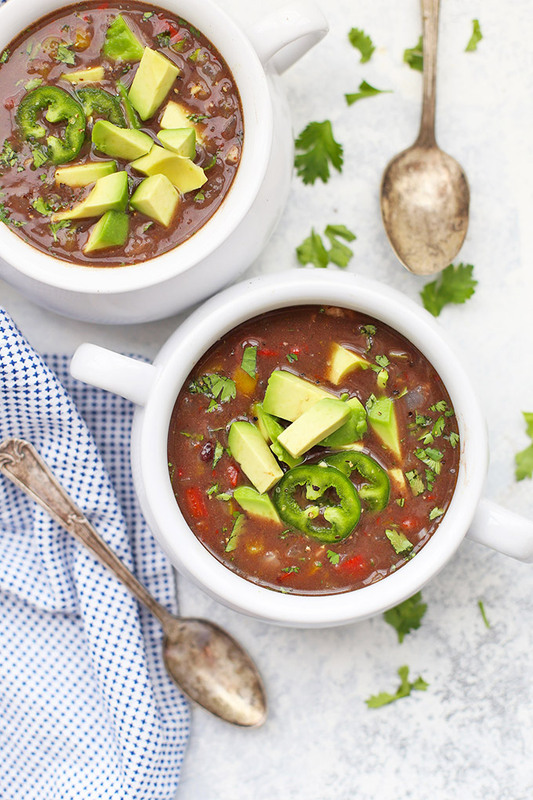 A few colored bell peppers, some cilantro, and diced avocado later and this soup is as much a feast for your tummy as it is for your eyes. If you make your own beans from scratch, you are awesome. Feel free to cook your own beans. I used the canned ones and love that all I really have to do is sauté my veggies, then stir in the other ingredients and the soup is done in about 20 minutes. It’s fantastic on day one, but I admit that I love days 2 and 3 even more! Blend part of the soup. You don’t *have* to do this, but I really love that it makes the soup a bit thicker. If you find your soup has gotten too thick, you can always add more broth. If it’s too thin, you can always add another can of beans or puree more of the soup. It’s all up to you! I love using my immersion blender for jobs like these. I scoop out a portion of the soup, puree it, and then return it to the soup. If you want an absolutely smooth puree, you can use a traditional or high-speed blender instead. Let’s talk about those jalapeños. I am a major baby when it comes to spicy foods, so these might come as a surprise. Pickled jalapeños aren’t quite as spicy as most fresh jalapeños (they’re often used in queso dip), so they give a nice kick without frying your mouth. I always recommend starting small (1/3-1/2 a can) and adding from there. If you don’t want to have big bites of jalapeño, you can also toss all the jalapeños you plan to use in with the blended soup, which will puree them and more evenly distribute the heat. I can find them at Sprouts, Target, Kroger (Fry’s), etc., but if you can’t find pickled jalapeños or don’t want to use them, you can substitute a small can of green chiles (don’t drain them!) and add them in with the onions and bell pepper. Change it up. To experiment with your flavors a bit, you can also try adding a bit (1/4 tsp or so) of chipotle chili powder or smoked paprika. Or, you can stir in a scoop of salsa. As for toppings… We’re a dairy free family, so we like ours topped with diced avocado or a dollop of our favorite avocado ranch (an amazing vegan sour cream alternative). If you’re not vegan, you can totally go the sour cream/cheese route. This soup is awesome on its own, but also plays nicely with corn muffins or corn chips, and is even good spooned over rice and eaten more like a stew. Since I’m using pantry ingredients like canned beans and broth, I try to use low-sodium or no-salt added beans and broth to keep this from being too salty. Then I can control the salt on my own. If you use salted broth/beans, you likely won’t need any additional salt. Heat olive oil in a soup pot or Dutch oven over medium heat. Add bell peppers and onion and saute 7-10 minutes, or until tender. Add black beans, cumin, salt jalapeños (or green chiles), cilantro, and 2 cups broth. To thicken the soup, remove 1-2 cups of the soup and puree it using an immersion blender or traditional blender until completely smooth. Return to the soup pot and stir to combine and heat through. Add additional broth to thin the soup out if desired, or puree more of the soup for a thicker consistency. Serve with avocado or your favorite toppings! 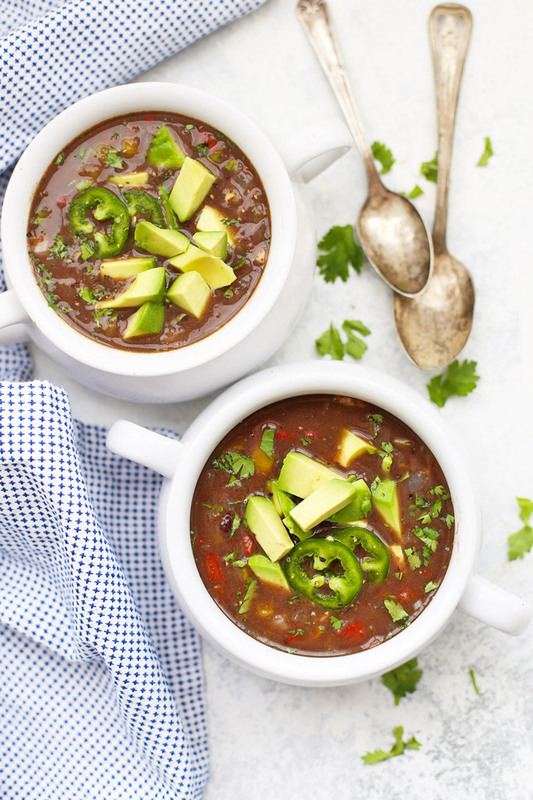 Black bean soup is one of my all time favorites! I’m adding this to the menu plan for next week! Do you have a brand of vegetable broth you love? 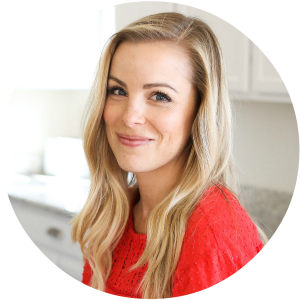 Kristi – I mostly use homemade, but in a pinch I’ve found Imagine Organic and Pacific Foods to both be pretty good! Thanks, I’ll look for those brands. I made this tonight and used the whole foods 365 brand and it seemed better than others I have tried. I love the simple recipe! I’ll have to try that one next time! Thanks for the suggestion! 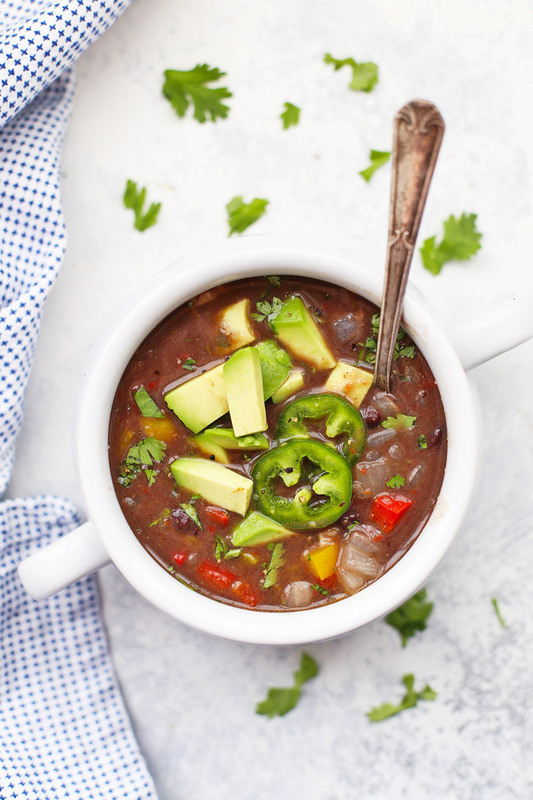 All my Black Bean Soup dreams just came true! I made this for dinner tonight. I have been trying black bean soup recipes for years, trying to find JUST the right one, and have always been disappointed. This one is perfection! I don’t know how I missed it and only just discovered it. Thank you, once again, for helping me feed myself (oh, my kids’ nightmare just came true because of how chunky this soup is, but I don’t care. I will eat every delicious morsel of it!). You’re the BEST! I love hearing this. It’s my favorite one to date. I love the little kick!